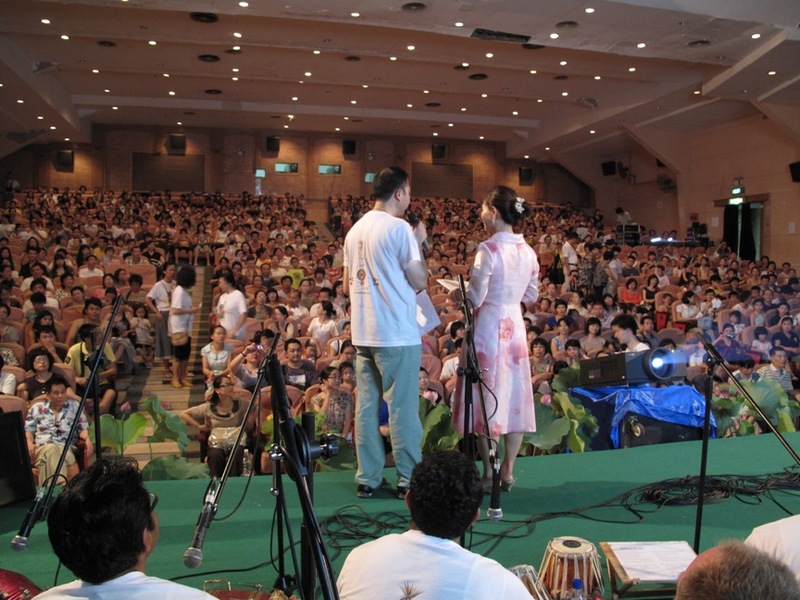 ‘Overwhelming hospitality in Guangzhou, China ‘ | Realise the World! Getting through the rather high-tech Chinese customs was very simple and the whole group went though without any problems. We were all amused at the notices that referred to foreigners as ‘aliens’. 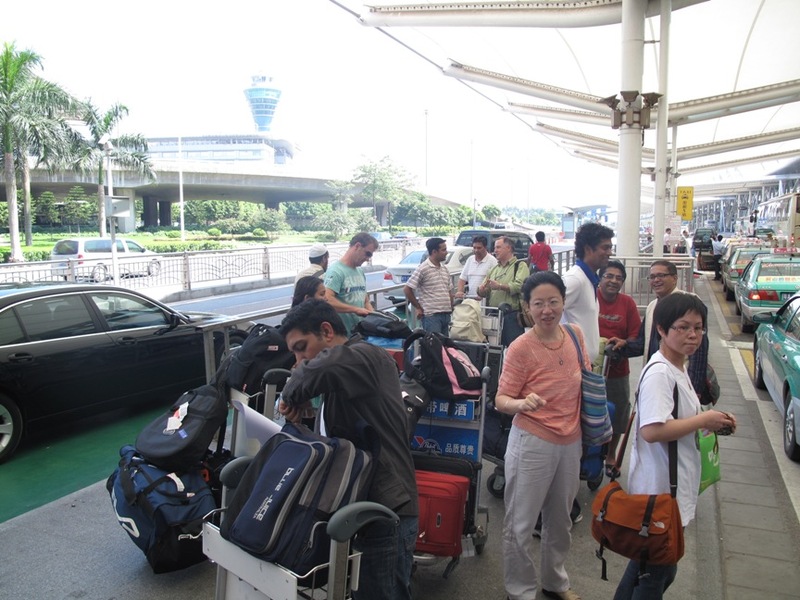 A small group of wonderful Chinese yogis met us at the airport and we set off towards the city of Guangzhou. In Guangzhou, the yogi’s treated us to the first taste of their overwhelming hospitality. Each and every yogi being unfaultingly sweet and deep and attentive to everything, and I think I can safely say that we were all blown away by the beautiful hotel and feast lunch on arrival. Alex Henshaw and yogis from the Hong kong district arrived to join us on the China leg of the tour. 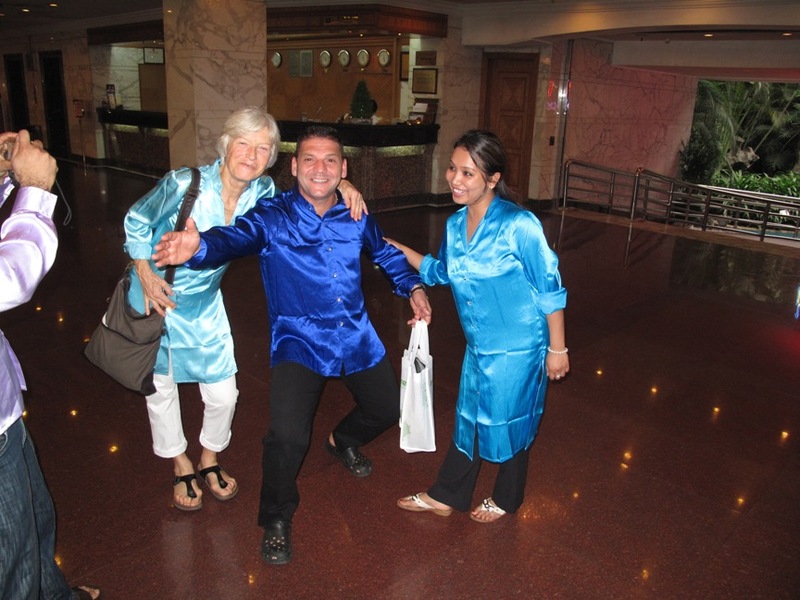 The Chinese yogi’s very sweetly made us beautiful vishuddi coloured silk shirts to wear on stage- Tony in particular looked like a Chinese John Travolta. Unfortunatly the tailors didn’t quite believe that westerners could be quite so big and tall so a few of the garments didn’t fit so there was much laughter and attempts to swap around shirts. On arrival at our first venue, we were met with the uplifting sight of many more local yogis all wearing custom ‘music of joy’ t shirts and working hard to organise the lobby. These shirts had a lotus on the front and a diagram of the subtle system on the back. Tony became our official mic man from that night on – he did a fantastic job co ordinating with the sound technitians ( with the Chinese yogi’s large help) in the heat. Unfortunatly the air conditioning was not working, so we were all immensely glad that we wore music of joy t shirts on stage. The heat was so bad that Kennan swears the wax on his didjeridoo was melting before the concert! 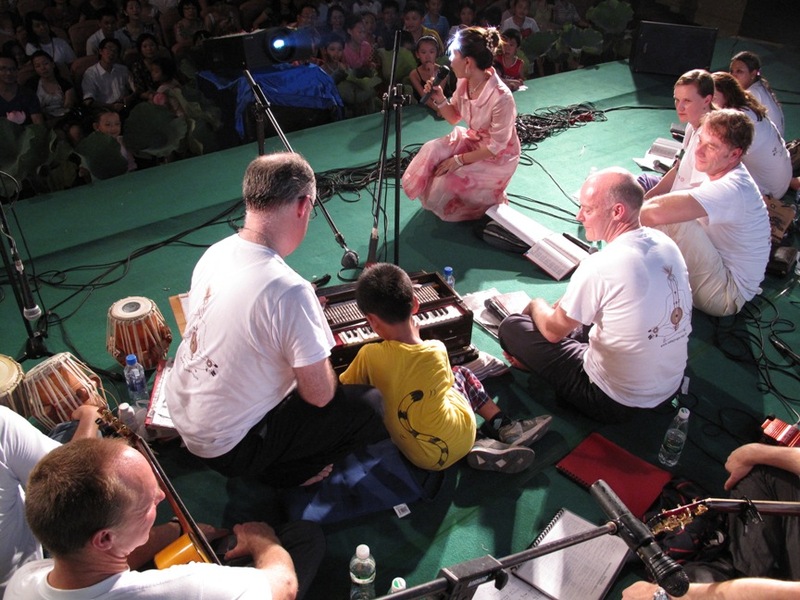 But of course, as soon as the concert started and the vibrations started flowing, we all cooled down, and even in Jogwa, now our preparatory self realization song, all of MOJ were so immersed in the music and vibrations that we did not notice the heat. The hosts for the night were Heman and one other yogini called Lynn, and to us, not understanding much, they sounded very much like t.v presenters, from Euro world vision or the like. The Chinese yogis lead the self realization section of the concerts very sweetly and beautifully and soon we were all in a very deep, timeless meditation. Chinese police officals arrived for the start of the concert and one stayed almost throughout. He enjoyed himself very much it seemed. Another section of the concert which made it all the more special was the presenters inviting a little boy from the audience to play on John’s harmonium. There was a sweet moment when John taught him how to play a little. The boy was very keen and didn’t want to leave! After the concert again we were over whelmed by the love and appreciation the Chinese showed us, we really felt we did not deserve it. After a half our photo session, where members of the audience also asked for photos- Kennan was particularly popular with his didjeridoo- we all went out for another magnificent feast with the local yogis. By the time we arrived at the hotel it was past midnight and we all had an incredibly restful sleep. We pray to our mother, please realise the entire world.